For nearly a year, Staff Sgt. Amanda Cubbage and Rick, her explosive detection dog, worked together while stationed in South Korea, performing security sweeps for visitors and military officials.While Cubbage returned to the United State last September, Rick stayed behind, as did a piece of Cubbage’s heart. On Tuesday, Cubbage got that piece back when the pair reunited in Tucson with smiles, hugs and plenty of tail wagging. An Air Force working dog for the last five years, 7-year-old Rick recognized Cubbage the moment he saw her and resembled a puppy more than a police dog as he rushed to greet her. While Rick wasn’t Cubbage’s first canine partner, he was the most headstrong and quickly won Cubbage’s heart. While Cubbage is on active duty at Davis-Monthan Air Force Base, Rick is now medically retired due to old age and will spend the rest of his life as a member of Cubbage’s family. A program called American Humane, along with support from Hallmark Channel, Hormel Foods and individual donors, paid for Rick to be flown from South Korea and returned to Cubbage, with his veterinary costs covered for life. 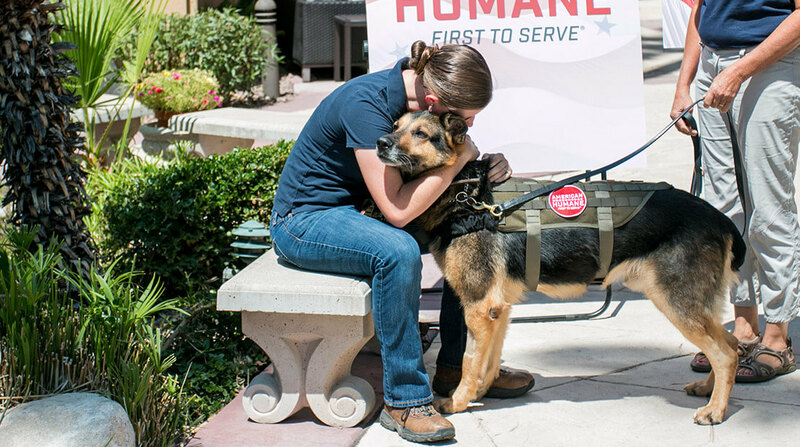 Cubbage and Rick are the 33rd military team to be reunited through the program, which she says she learned about through another dog handler who was able to adopt.